The untitled Landscape painting of c. 1958 is shaped by the reductive and taxonomic echoes of his teachers, John Passmore and Godfrey Miller, as well as textural qualities and organic elements of Desiderius Orban. It expresses a decisive break with his earlier flirtations with figuration in favour of linear and meditative abstraction. The work is indicative of the cumulative influences experienced by the artist during his overseas sojourn of 1957-1960, which was financially supported by his early patrons, Robert and Annette Shaw (later Olszanski). His travels and interaction with the contemporary British, French and Spanish artists resulted in a “new way of thinking about pictorial structure and a reduced dependence on external realities”. The artist hungrily absorbed visual and aesthetic innovations of artists as diverse as Kandinsky, De Kooning, Dubuffet, and Klee. 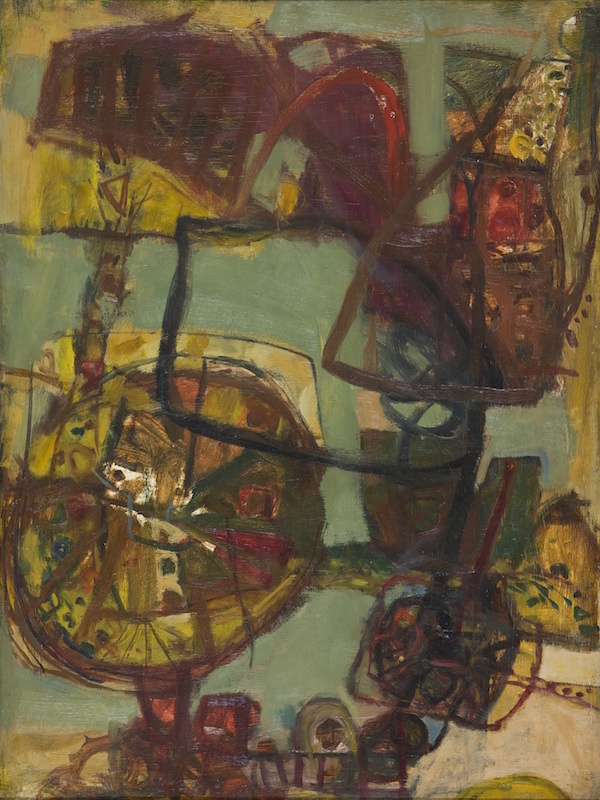 The influence of the French school links the Landscape to Olsen’s contemporaries Leonard French and Roger Kemp; while the fragility of the composition expressed through intentionally imbalanced composites within the painting, and especially its reminiscence of machine forms, links the work to Bill Rose and Robert Klippel, with whom he sustained a close friendship during the 1950s. As such, the Landscape posits itself in the epicentre of the contemporaneous Australian art movement.